As you can see from my blog header the foundation in which this blog was started was 2 Timothy 1:7 "For God has not given us a spirit of fear or timidity, but power, love and self-discipline". This scripture has been a rock for me and my entire family as we dare to take risks that we know God is calling us to. I want to show you what that looks like for me so this will be a 3 part blog series as today I begin with power. What is power exactly? Many of us probably think of a power lifter who is on a mission to lift as much weight as humanely possible. But the kind of power I am referring to isn't power in our own strength, it is power that comes from the Lord. The Lord not only gives power but he IS power. Think of it this way, if you give a gift to someone you usually leave them and they keep the gift. But God gave us a gift of power(one of our many gifts from him) but then he stays. We will never have greater power than when the presence of The Lord is upon us. The Holy Spirit brings the kind of power into our lives that no man or demon can steal. The dictionary defines power as "the ability to do something or act in a particular way". While on the contrary, timidity is defined as "lacking in self-assurance, courage, or bravery; easily alarmed; shy". Wow how different these two are yet both have one thing in common and that is our actions. It used to never occur to me that I had been given power by God. Once I learned of this power he has given to us I had to decide what I would do with it. Would I give the power to God and let him work in and through me or would I give the power to the enemy and allow him to keep me in my shell, too terrified to speak or act for fear of rejection or failure? In my opinion, we never stop making that decision on a daily basis. I read an article that described an illustration a university professor did on the first day of class. He drew a black dot on a white board(as I have illustrated below) and asked the class what they saw. Everyone said they saw a black dot but not one person mentioned all of the white around it. 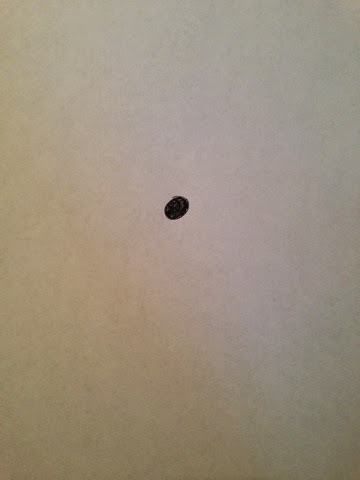 This black dot represents the one thing that holds us back from stepping out, taking risks and believing God's word. It also represents the "goliaths" in our life. If we aren't careful those Goliaths get more praise than our God. How do we move from a place of timidity to a place of power? For me, God's power is released in my life when I press into him in prayer and reading his word then choosing to focus on how BIG the white is(our God) and refusing to allow any black dots(circumstances, etc) to dictate my days, thoughts and actions. As we choose to focus on the things above everything here on this earth will fall into place. My final thought to you today: What is holding you back from moving forward? Take a step of faith and the power of God will be with you. This post was very much "on time" for me. I have been saying that same verse to myself for the last two days. Your writing is so good! I enjoy it! Thank you Amber, that means a lot to me!😊. So glad this spoke to you too! Hi Rachel, I've followed your sister Sarah's blog for the longest and I'm grateful her blog brought me to you. You have no idea just how much this spoke to me. I could probably write a novel as to how but I'll just say thank you and say that I look forward to reading much, much more.